We had exactly 48 hours from wheels down to wheels up in San Francisco, and while we didn't just fly direct to and from Dubai, we were only in California for a week total - still crazy to go to California for only a week with 16 hour flights and 12 hour time changes on either side. Enough complaining from us and onto the good stuff! We walked direct from the airport to the BART and made our way into the city, easily the fastest and cheapest way to start your 48 hours in San Francisco. You might have heard horror stories about the crazy prices of everything from apartments to taxis to meals in San Francisco, and while yes, rent and hotels are more than in other US cities, we found an amazing place to stay - the San Remo Hotel - right in the middle of North Beach, walking distance to so much you want to see. Affordable, unique and friendly, this was our first true hidden gem of the trip. Shout out to VisitSF for suggesting this perfect hotel and for giving us endless resources to plan our trip before we arrived. Highly recommend taking advantage of all their links and knowledge before arriving, especially if you feel a bit overwhelmed. We got SO lucky in San Francisco, with two full amazing days of sun, something that doesn't happen very often. (We also got two amazing days of sun during our 48 Hours in London, what are the chances!) Knowing we would be exploring a lot around North Beach, we jumped in a Lyft to Haight Ashbury and started our walking adventure bright and early before we had the chance to take a nap. Strolling through one of the hippest neighborhoods on Earth, we dipped into colorful book stores, passed amazing restaurants and cafe's and Anne started to spend all our money on artisanal candles and other nonsense. Luckily we were nearing Golden Gate Park, and after dipping into Amoeba Music and stuffing our faces with kate at Whole Foods, we wandered into Golden Gate Park, one of my favorite parks on Earth - easily. Golden Gate Park has some amazing hidden treasures, but the Japanese Tea Garden has always been a favorite of mine. 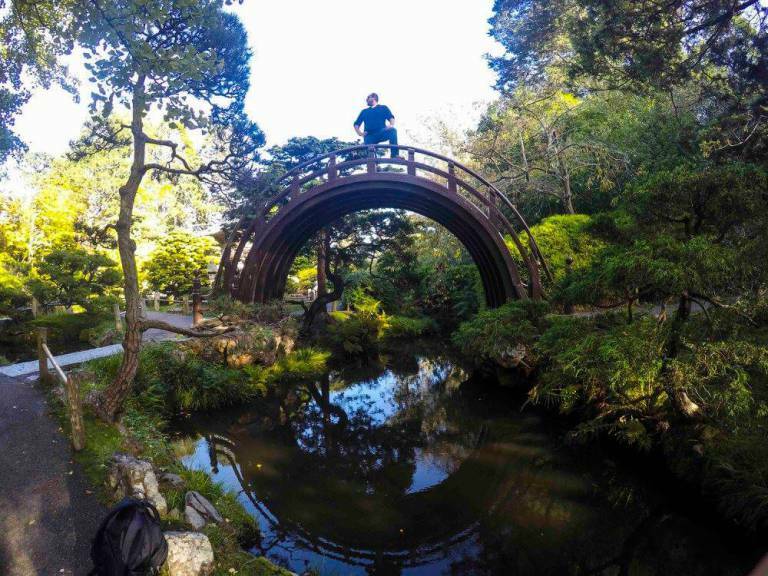 It is an amazing bit of tranquil zen-like pathways, statues, buildings, and fountains, of course including a traditional tea house and garden - a must visit, even if you only have 48 hours in San Francisco. Jumping in yet another Lyft (no, we aren't associated with Lyft, we just loved them in SF!) we hurried over to the Palace of Fine Arts and found ourselves on the Presidio beach just as the late afternoon sun was beginning to set, an absolutely stunning view of the Golden Gate Bridge in front of us - one of the most iconic views in the world. As the sun began to go behind the trees we headed for China Town, to world famous Grant Street, home of the oldest China Town in the United States where we bought nicknacks, souvenirs and had some amazing authentic Chinese dumplings. At this point, we'd been awake for nearing 36 hours and were faded fast. Quickly back to North Beach and the cozy San Remo Hotel, we passed out for a couple hours to awake bright and early for our last day in the city! As the sun rose, so did we and we headed out into North Beach to an American institution - IHOP. After utterly stuffing our faces with pancakes, we headed to Pier 33 to pick up our tickets from Alcatraz Cruises for a morning trip to one of the most famous prison islands on Earth! Alcatraz was recently named the number one tourist attraction in the USA and the number eight in the world, only behind the Taj Mahal, and it is still just as mysterious to me today as the first time I went 15 years ago. I enjoyed scary Anne at every chance possible and the boat ride out gives an amazing view of the San Francisco Bay in every direction, as well as the Golden Gate Bridge - absolutely must be on the list during 48 hours in San Francisco. Arriving back to Alcatraz Landing, we had 90 minutes before our tour bus headed off to the Muir Woods, which was just enough time to explore the world famous Pier 39, eat a corndog (Anne actually liked it! ), see the sea lions, buy some super tourist t-shirts and enjoy a couple of pints in the sun. Before we knew it we were off on a bus, across the Golden Gate Bridge, and into Marin County to explore the Muir Woods. 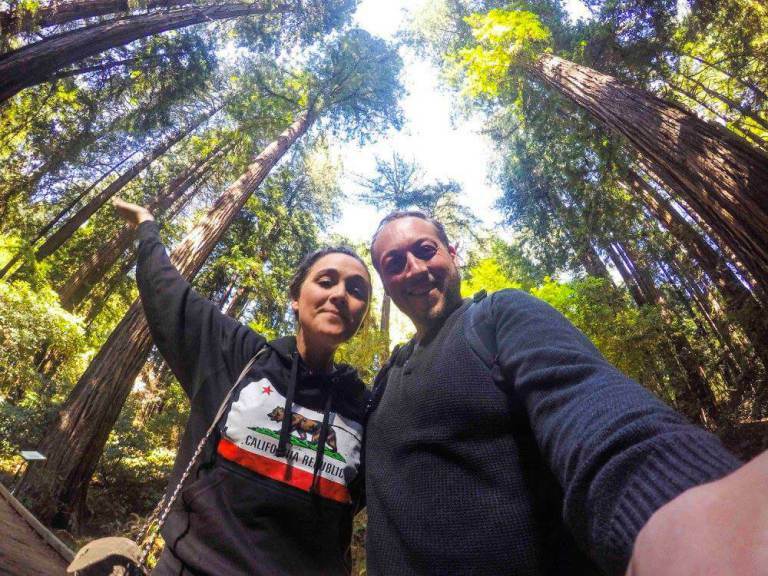 One of the truly stunning places in the United States when it comes to nature, the Muir Woods are a gem, and somewhere everyone must go at least once. These amazing trees, hundreds of years old and standing over 200 feet tall, create one of the most unique experiences and visuals imaginable - a silent, humbling and refreshing of how incredible nature is, and just 20 minutes outside of the city. We opted to get off the tour bus in the quaint town to Sausalito, just before the bridge and walk back across the Golden Gate Bridge into San Francisco in the late afternoon light. Anne is terrified of heights, so this was a ton of fun to watch for me! She was a great sport, and we took our time admiring the incredible feat it was to build such a structure. A bridge so big it takes seven years to paint and if all the cables were to lay flat on the ground they would circle planet Earth THREE times! How insane is that? Safely back in the Presidio, we headed to Ghirardelli Square for some free samples, dreamed of living in some of the multi-million dollar houses we passed - some of the most expensive homes in the USA - and jumped in a Lyft to the Mission District to end our night, and our 48 Hours in San Francisco. The Mission District has some of the best food in San Francisco, and if you know anything about Anne and I, we love Thai food, so when we stumbled on Hawker Fare with a friend of mine from college, we were thrilled and in for a treat. We spent the evening enjoying laughs over Singha beers and spicy chili soup, an incredible end to the perfect weekend in the city by the bay. Did we only dip our toes into experiencing all there is to do in the bay? Yes. Did we leave off endless amazing things you'll no doubt scream at us about? 100%. But will we be back for at least another 48 hours in San Francisco sometime soon? Hell yes we will, and that is all that matters. We take all these crazy trips to not only show what can be done in just a weekend, but to give us a taste of the amazing places we cannot wait to get back to. Unfortunately for us, that is almost everywhere we go.